Resil is part of a modest family and lives in a tropical village. His father, who is a nice person, uses a hammer to work as a carpenter and helps repairing things at home and around the village. Resil sometimes helps his father at work. Resil lives with his family in the countryside, in a house where there is no electricity. He has a younger sister who is 10 years old and he loves her a lot. Resil, who is a very smart and clever boy, enjoys going to school and he loves playing football with his friends. The school is not near from his house, this is why his father sometimes picks him up from school in the evening and they go home together. He has a blackboard that is very important for him because he has no paper to write on. Resil also likes staying alone in his room, where he can read, write, and sometimes study the Koran. Even if her sister is old enough to go to school, she stays at home with her mother who cooks rice, vegetables and potatoes every day because is the common and available food in the region. However, one month ago Resil ate lamb because there was a big celebration in the village. At home, there is a locked door and Resil doesn’t know what is behind it. One day he finds a key and he supposes that it opens the locked door. When the mother acknowledges about Resil’s finding, she begins to cry because she knows that the door contains the money that will be used to offer a better future abroad to Resil. This money was obtained by selling part of their lands. So she is sad because she knows that they soon will have to tell Resil that he has to leave. The things that make Resil feel safe are: his father, playing football, religion, school, his room, friends, the candle.The things that scare him are: poverty, an unsecure environment, the cry of her mother and the whispering, the sense of familiar responsibility (in case something happened to his father), parents in danger. All of a sudden, his life circumstances change. After having found the key, Resil and his mother open the locked door. Behind this door there is some money, a gun that his father keeps to protect the family and an ancient religious symbol belonging to his family since so much time. He then gets to know the intention of their parents to send him abroad. Resil then understands that his future may not be there, in his village, but elsewhere. Moreover, the political situation in the region is getting worse to the point of stopping school attendance and the parents want Resil to be safe and give him a good education abroad in order for him to be able to send some money to the family. In his room, Resil reflects on what is going on. He feels oppressed by the decision made by their parents and doesn’t understand well the overall situation. However he has the feeling that there is no future for his family unless he leaves. He has some friends who have already left. Actually he receives a letter from a friend who is leaving in London explaining his adventures and his new situation. He also receives a pocket dictionary from him. Resil starts preparing himself for the future by studying a new language. One evening the father buys a travel bag for Resil in order to start organizing the trip. However, the destination is still unclear, there are different options on the table. 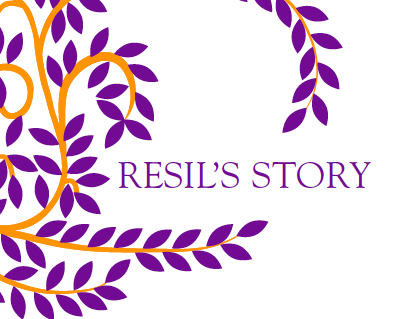 The things that make Resil feel safe are: He feels important, at the center; he can contribute to the family wellbeing; religious symbol; the fact of having a gun to protect them from enemies; the friend abroad; the possibility to learn the new language; the money saved. The things that scare him are: uncertainty; the sea because he cannot swim; the guns that enemies may have; dangerous environment/political situation of the region;not having papers or documents; not being with his family anymore, loneliness; leaving his friends. Resil is planning a long trip. He will probably need to walk, take a bus, a plane and a boat. It seems that he will reach France from Italy by train. Someone his father knows is facilitating the trip and promises him a new passport in the new country. Resil has some friends living in London and his parents know some people in France. However Resil knows these destinations only for the stories that he heard in the village. He finds one friend in the village who is leaving as well and he knows that he is going to travel with other people. His parents have the money to pay the trip to the organizer. Even if Resil does not know him, he has no choice but to trust him even if he is afraid of being alone with him. He feels very sad and says goodbye to everybody. Her mother organizes a sacrifice before leaving that will protect and bless him. The mother is a very strong woman and she has probably taken the decision of Resil’s departure. Instead, the father is full of hope; actually he had the deal with the smuggler. There is a lot of expectation from the community, therefore Resil feels responsible. The things that make Resil feel safe are: the smuggler is a known person; there is other people travelling with him; a friend from the village is leaving too; smuggler’s promises; pocket money; new shoes; bravery; the sacrifice. The things that scare him are: smuggler; dangers of the journey; the boat and the plane; length of the trip; security check; not being able to pay the money for the trip and the consequences. Resil wakes up at 4:00 A.M and he realizes that the plans do not correspond to reality. There will be no plane, he will directly reach the sea. He is willing to go to an internet point to warn the friend who is in Europe but the smuggler tells him that there is no time. The smuggler doesn’t give him the promised new passport; this is why he won’t take the plane. Moreover, the smuggler asks for more money. There are other people in the same situation. Finally they get into a small boat that will bring them to Europe. They have just one bottle of water and they are very thirsty and they will be under the sun for several hours. He feels sick because he is not used to be in the sea. He realizes that the smuggler is not a friend, as his father had told to him. The driver warns them against coastguards. Suddenly, he finds himself in the sea but fortunately he has a life jacket that he had obtained by exchanging his watch because he was very afraid of the sea. The coastguards find him and bring him to the coast. Once he reaches the coast he runs away from the police because someone had told him to avoid the police since they would probably take his fingerprints which would prevent him to reach France. He meets someone in a cyber café that helps him arriving in France from Italy by train. Since Reisl doesn’t trust anybody anymore, he uses his own map to orientate himself and understand where he is. He has no train ticket so the train inspector takes him off the train in Lyon. He takes another train and arrives in Paris. He is very hungry. The things that scare him are: no passport; jail; police; coastguards; loneliness; no trust; different language; he loses his friend during the trip; smuggler; uncertainty; death. Resil knew that UNHCR is an organization that gives permits. So he gets a map and finds it. He goes there and he gets an X-ray exam to know his age. But it takes too much long and he leaves from there. He finds a person that gives him other information. He decides to ask UNHCR whether the information is reliable and they confirm it. They say that the organization exists so he goes there, where he will meet other children. But he is still living in the street, sleeping in the metro station and eating in the organization. He knows the place where the people from his country use to gather up. He then tries to understand the different available options. He feels disappointed because Europe is not what he expected. In the organization, he meets a person who orients him and who writes a letter to ask for protection. However, it will take a long time. So he goes to the mosque to try to get in touch with someone who may help him at finding a job because he needs money to pay part of the travel costs back, otherwise his family would be on a serious trouble. He tries to find solutions and a co-national proposes him to work in the black market as drug dealer. This co-national assures him that as he is a minor, he cannot be imprisoned. So Resil accepts because he desperately needs to earn money. He sleeps bad, he feels tired and sick. Resil feels homesickness. He gets in touch with his family through Skype because someone in the village has internet connection. He continues to keep in touch with the person from the organization and after 6 months he gets protection services. He gets a place in a childcare center where he can sleep in a bed. However, he is very worried about the money and since he can do the carpenter he could find a related job. However, he feels that the protection services and the overall situation in the new country are not responding to his real needs and worries. So he is still confused in relation to his expectations. He suffers from panic crisis and is very nervous. Some psychological support is offered to him. Resil’d priority however is to earn money for his family, so the psychological distress is closely related to practical issues. He is also worried for the moment when he will turn 18. At least, Resil has learnt a little bit the new language. Finally, the organization helps Resil at finding a job as carpenter in order to have money to send to his family.